Tom’s going back to uni…in Harvard! We don’t want to blow our own trumpet or anything, but we’re kind of a big deal. Want to know why? Well, our very own director of All about the Idea Mr. Tom Tuke-Hastings has been awarded the new and prestigious Marketors’ Harvard Business School Bursary, an exceptional opportunity with a place on the Advanced Management Programme at the much esteemed Harvard Business School. Tom was formally awarded the bursary at a special event to mark The Marketors’ 40th anniversary, which took place on 23rd April at Stationers’ Hall in the City of London. This bursary is newly launched by the Marketors’ Trust and is worth around a whopping great £50,000 per entrant. While originally there was to be just one bursary awarded, Tom managed to impress Marketors’ Master Andrew Marsden to such a degree that Andrew decided to award it to two people, both Tom and Lesley Wilson, Head of Marketing Profession at BT. As such, from September Tom will spend 8 weeks completing this course in the leafy grounds of Harvard University, located in Boston, Massachusetts. So it’s safe to say that Tom is pretty jammy, but his being awarded this prestigious bursary was not without its merit. All entrants took part in a rigorous application process, in which they were required to present their case in the most creative way possible. 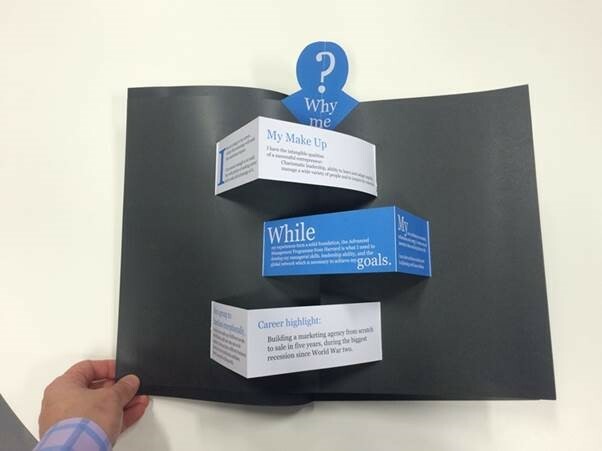 Tom presented his application in the form of a ‘pop-up’ presentation, a move which so impressed the judges that it is now being used by the admissions team as an example of best creative practice – OH YEAH. What is also exceptional about Tom’s winning this bursary is that most people enrolled on the course are aged around 50, so he is likely to be the youngest participant by a significant margin. Good luck Tom, and bring us back some Hershey’s Bars (and obviously the wealth of management acumen you’ll have acquired) – but mainly the Hershey’s Bars.